This episode of Q&A with Adee Cazayoux, founder of Working Against Gravity, is all about vegetables and fiber. Q: Why do we track our fiber? 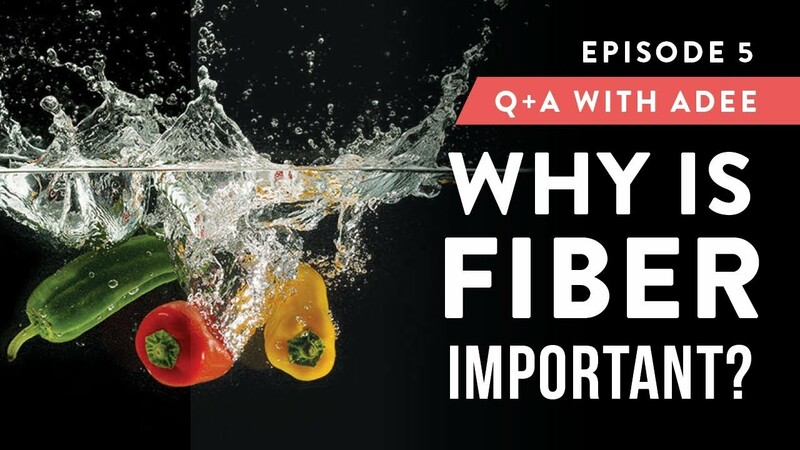 A: Fiber does a lot of great things for us and it’s really important. First, it’s good to know that there are two kinds of fiber, soluble fiber and insoluble fiber. Soluble fiber is soluble in water and creates a sticky, jello-like substance in your body and it can help slow absorption and digestion of your food and regulate your blood sugar levels. It will help you stay fuller longer and get the most out of your food. Some good sources of soluble fiber will be oatmeal, nuts, beans, barley, apples and blueberries. Insoluble fiber is opposite of soluble fiber and does not dissolve in water and is great for maintaining a healthy digestive system. You’re going to find insoluble water in vegetables as well as in whole grains. As you can see, there are many high-fiber options. Most of the high-fiber foods are attached to micronutrients, that’s why it’s important to count your fiber. If you find your fiber count is really low, then you’re probably not eating enough vegetables, fruits or whole grains. That also means you're not getting a lot of micronutrients, vitamins and minerals in your diet, which are really important to being healthy and happy. As a good start, we would recommend 10 -15 grams of fiber for every 1,000 calories you’re eating in your diet. Q: Am I going to feel starved tracking my macros? A: Anytime you start dieting, one of the first concerns is “Am I going to be starving all the time?” No one wants to be hungry or starving, so I do have some strategies to help you combat that. Also, when you start paying attention to your nutrition, you’re thinking about food a lot, so often you may get a little hungrier when you first start. Eventually you’re going to get used to it and it will be no big deal and your hunger will subside. One tip I will give you to help with that hunger is to eat more vegetables and low carb fruits and whole grains. These are higher volume foods, so the amount of broccoli I can eat for the same amount of carbs I’m going to get in 4 or 5 gummy bears. This is going to be a huge difference in the amount of space it takes up in your body and the amount of fiber that will keep you fuller for longer. So opt for vegetables and foods that come with more volume with less macros. Q: How can veggies be my ally when tracking? A: We just talked about how veggies are going to be your higher volume option. Not only will they take up more space in your stomach, they are also going to come with less macros, so you can eat way more of them for fewer calories. Vegetables are also going to help keep you fuller longer and they are packed with vitamins and minerals. Veggies can also help you recover better from your workouts and help you have a longer and higher-quality sleep. And if you start adding a ton of vegetables in your diet, you’re going to find that it’s easier for you to wake up in the morning and maybe your skin will get clearer. There are plenty of benefits that come from getting veggies and fruits. I’m challenging you this week to be a little smarter about your nutrition and get an acquired taste for veggies that comes with wisdom and time. Just like when you first start drinking wine, no one likes it at first, but as you acquire a taste for it, you can see the benefits. That’s the same thing with vegetables. So I challenge you this week to try one new vegetable that you haven’t incorporated in your diet, maybe something that’s locally fresh and in season. For help getting your veggies in, check out this blog on Creative and Delicious Ways to Enjoy Vegetables.